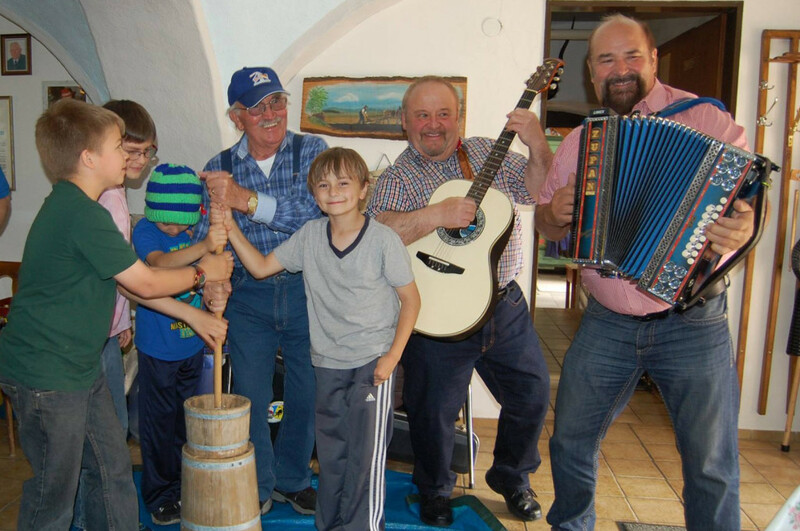 Walter Brunner, pictured here in a blue hat, churns butter with members of the KONTAKT club. GRAFENWOEHR, Germany — If you are interested in host nation culture, people and events, then the German-American KONTAKT Club is the perfect place to mingle with local nationals. The KONTAKT club was founded in 1969 by U.S. Army Europe and the German Federal Ministry of Youth, Family, Woman and Health. It even has its own regulation: “Army in Europe Outreach – KONTAKT Program,” Army in Europe Regulation 360-90. The goal of KONTAKT is to share interests, culture, language and more. Within the USAG Bavaria footprint there are KONTAKT Clubs in Grafenwoehr, Vilseck, Amberg and Hohenfels. I sat down with Walter Brunner, the German KONTAKT president at Grafenwoehr/Tower Barracks. Walter has been a member for 25 years and the KONTAKT Club Grafenwoehr president for 15 years. Q: Was there any special event or highlight in the past? A: The KONTAKT Outreach conferences are always very special. You can exchange ideas with other clubs and it’s also a great opportunity for awards. Q: Was there any special event you can think about? A: Sometimes the simple activities are most fun. Like churning, making butter like back in the old days. Together with Bavarian music and beer, this is a great way for Americans to experience old German traditions, music and culture. Q: Can you highlight some of your activities? A: We are doing a lot of different activities, like bowling tournaments, social gatherings, dinings out, wine trips, BBQs, Christmas parties and more. Q: How much are the membership fees? A: The fees are 15 euros per year for Grafenwoehr and Vilseck and 17 euros per person and 25 euros per family for Hohenfels. Q: KONTAKT / Outreach is a German-American friendship club, are other nationalities also welcome? A: Of course all nations are warmly welcomed. For more information, or if you would like to join, visit the following sites.